The Hetzenberg Chronicles: The Line Cavalry Brigade. Hetzenberg's line cavalry arm comprises just two regiments, the Rumtopft Dragoons and the Noamchomski Hussars. The former are an unglamorous workaday line regiment who still serve as mounted infantry when required. They were created in 1720 by amalgamating two smaller dragoon regiments which had seen hard service in the wars following the collapse of the Empire. Both regiments saw much action and their successor has the united battle honors to prove it. Their guidon bears the crossed arrows crest of their depot city of Rumtopft. 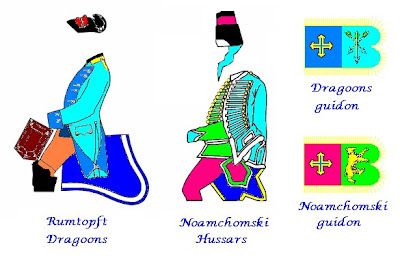 The Noamchomski hussars are a brand new creation, raised to follow the latest fashion in light cavalry. Their flamboyant garb is mirrored by their equally flamboyant behaviour. It was thought that brigading them with the sober and highly experience Rumtopft regiment would lead to trouble, but the hussars took one look at the battle honors on the dragoon's standard and paid them due respect ever since. It remains to be seen how the two work together on the field of battle. Their guidon device of a rampant bear is the the family badge of Count Nicolai Noamchomski, Colonel-Proprietor of the regiment. As I'll be using the SYW option in the Shako rules, the line cavalry will be in 12-figure strong units and the hussars will be 24-30 figures. Final size will be determined at a later date. But a double-size hussar regiment... Indeed they were so in Prussian service, but not everywhere else -and I guess that even the Prussian ones often acted by 1/2 regiment. I don't know the Shako rules, but a double-strenght regiment may be a little unwieldy; and it's ahuge investment in points (if you use them) [money] and painting time, specially with hussars? What a lovely set of colourful uniforms you have designed (as shown in this and previous posts). Thank you, gentlemen! Jean-Louis, the Shako rules are mainly for Napoleonic, with a SYW supplement. They're a good, clean, and above all fast set of wargames rules, and most of the guys in the club know them. As for the size of the hussar regiment, I'll see how things go. The cavalry officers of Pfalz-Kognat-Obersayn are devotees of Oberst-Inhaber Noamchomski's aphorisms, but, while many quote them, it's not clear that any of them really understand the deeper structure of them. It's good to know Oberst-Inhaber Noamchomski has devotees in the illustrious regiments of Pfalz-Kognat-Obersayn. Others may find his interrogative style of conversation a trifle off-putting at times, but his blow-by-blow battle accounts leave his audience spellbound!